I love hiking. It's the best way to get away without going far or spending a lot of money. Even when I'm traveling, I try and get out to get a lay of the land and explore new landscapes. Where we live in Bloomington, Indiana we're only a few minutes from a huge national forest. Do you take advantage of public lands in your area? Now that spring is finally here, we're out hiking all the time. The weather is perfect; it's not too hot but it's also that time of year when those elusive morel mushrooms start creeping up from the forest floor. Ryan and I started casually foraging while in grad school at The University of Georgia; we'd find oysters, chanterelles, and bear's tooth mushrooms by the backpack-full but morels eluded us more often than not. In the South there isn't much of a spring, just a couple of weeks of mild weather before it moves into the heat of summer. The Midwest offers a more stable climate for wild mushrooms, so hunting up here we have much larger hauls, especially for morels. Thanks to my mushroom obsessed husband for helping with this post. There are many varieties of wild-edible mushrooms, but most who have eaten them say that morels are the most delicious because of their rich, meaty, and earthy flavor. They're also some of the easiest mushrooms to identify; there is only one type of mushroom for which they might be mistaken, the false morel, which is easily distinguished from the true morel. The hollow body structure of the true morel is easily identified by cutting it in half from top to bottom. In some circles, morels are also referred to lovingly as a "land fish", because they resemble the silhouette of a fish when cut in half. If you cut a false morel in half you can clearly see that it is not hollow inside. The caps of black, grey, and yellow morels are full of nooks and crannies holding millions of spores and are connected to the stem. The less common half free morel (we've never found one) has a spore bearing surface that is connected at the top of the stem and hangs from it like an umbrella, hence the name "half free". No matter the variety, when you slice a true morel lengthwise, it will be completely hollow. I'd recommend reading up on the false morel before you go hunting so you can positively ID the correct mushroom. Disclaimer from Ryan - Don't eat any mushroom based on what you read here. Make sure you do your own research and feel confident identifying before you go frying up any mushrooms you find in the woods. We've spent lots of time reading about mushrooms online and use this field guide when we're hunting; its fun to find and identify species that you are not familiar with! "There's old mushroom hunters, bold mushroom hunters, but not any old and bold mushroom hunters"
Keep these words of wisdom in mind when making the decision as to whether or not to eat ANY mushroom that you have found and believe to be edible. If you are not 100% sure about the identification of a mushroom, any mushroom that you believe to be edible, DO NOT EAT IT! If you do, you will be a bold hunter and put yourself at risk of an upset stomach or even worse, renal failure and a painful and untimely death. So, that being said, mushroom hunting can be a very fun, addictive, and rewarding experience if SAFETY is the primary goal for yourself and for those for whom you assume the responsibility of positive identification when cooking and consuming the mushrooms that you have found. Morel hunting is a serious sport up here in the Midwest, and for good reason. First of all, it's free food that is delicious. You can even make a few extra bucks by selling them to high end restaurants too (check regulations about selling morels harvested on public lands!). Prices range a lot depending on who you're selling them too but I've seen them go for $40-$60 a pound. It's a lot of fun too; like playing the most difficult game of hide and seek with Mother Nature. I often think about Her watching all of us silly humans wandering around the woods, heads down, shouting out with glee when we find just one. Most people don't shout so as not to giveaway their location... I do though. It's hard not to get excited. You spend hours scouring the hills and when you find one it is freaking exciting. Due to their somewhat mythical and mysterious status, my husband advocates this mind-set: "you have to believe that they exist and that you will find one, if you want to find one. Nobody that didn't believe in a Unicorn ever saw one!". It's easy to feel like they DON'T exist after a long day of hunting only to return home with empty sacks, so we tend to follow this mantra until successful. Mushroom hunters are notoriously secretive about their spots so you're not likely to find google maps online of exact mushroom patches. I've been hunting with Ryan for several years, gradually learning how to interpret the landscape. While I can't share specific spots with you, I can share some environmental indicators and other tips to help you find them in your area. Spring is the season to start looking. When the trees are starting to bud is a good time to get out and survey the land, and there are several folk rules related to plants about when and where to start looking. Start looking when the oak and elm leaves are the size of a squirrel's ear. Look around live, dead, or dying elm, ash, black cherry, tulip poplar, and maple. Mature stands of hardwood trees such as oak and hickory varieties may be good host environments. Areas with old wild grape vines may indicate good conditions. Morels don't grow on trees but near/around the base of trees because they tend to be associated with and form a symbiotic relationship within the roots of the host trees and other plants nearby. Sometimes they're covered by leaves so walk carefully. Hunting during or after a rain can increase your chances of finding morels because the rain will push the leaf litter down and expose mushrooms that might be hiding otherwise. Hunting on overcast days may make it easier to spot morels since the sun will not be casting bright rays and subsequent shadows on the leaves, making it easier to pick out the shape and texture of the morel. Hunting in bright light can strain the eyes. Use a compass to locate and target south-facing slopes when the season is just starting. These slopes are hit by the sun at a more direct angle so the soil in these areas warms and wakes up to spring earlier than others. As the season progresses, it also pays to use that same map and compass to locate and look in areas with north facing slopes and creek bottoms. Ryan LOVES to hunt open creek bottoms; our biggest finds have been in creek and river corridors, for which the same rules about South vs north facing depending on the progression of the season are applicable. Trilliums, trout lilies, bloodroot, and may apples are good environmental indicators because of their need for rich, moist soil with a healthy composition of nutrients and soil microbiota. We've started finding black morels when the trilliums are in bloom. Morel fruiting (when the shrooms come up) is moderated by ground temperature and availability of water. Gray and yellow morels are thought to begin fruiting when the ground temp is around 55F, and ends once the soil temps begin to creep into the mid 60s. Wait until there has been a week of air temps with high's in the 60's and lows in the 40's; the season is likely over once the highs are staying in the low-mid 70's. Hunting several days after a good rain (at least .5 inches to 2 inches) may also increase your chances of a successful hunt. Note: This section contains affiliate links. If you click on one of the product links, I’ll receive a small commission. Wear comfortable clothes and good walking boots. When we go out we're often going up and down the rolling hills so good footwear is essential. I have these Merrell hikers that I love. Great ankle support and comfortable. I just recently purchased these Asolo boots that are a bit beefier and full leather. Ryan advocates wearing sturdy leather hiking boots with full ankle support and an aggressive treaded sole made to handle steep and rugged terrain such as these La Sportiva boots with Smartwool socks, canvas or thick denim pants (his favorite make is Carhartt) and a light weight breathable top such as Patagonia's Capilene silk weight long sleeve. Don't forget that spring showers bring the flowers. Be prepared with adequate rain gear if the forecast calls for a chance of rain. Ryan brings a Mountain Hardware shell, and I have a Patagonia shell, both of which are made with Gore-Tex semi-permeable water repellent fabric. Gore-Tex is a breathable waterproofing that lets your perspiration moisture out while keeping the rain from getting in. Don't forget that part of the fun of Morel hunting is to be comfortable! Anyone going into the woods and off trail should also take measures to prevent contact with chiggers and more importantly, ticks, which can carry a number of debilitating disease pathogens including Lyme's Disease and Erlichia. Tuck pant bottoms into socks, and shirt into pants; this helps to prevent ticks from getting under pants and shirt, and makes them easily spotted and removed from the clothes. We regularly apply a chemical called Permethrin to our mushy hunting and woods tromping clothes (apply and allow to dry for a day before wearing). Permethrin is readily absorbed by any fabric, stays on for several washes, and is not readily absorbed by the skin while providing protection against ticks, chiggers, and mosquitos. You can also spray DEET insect repellent directly on your clothes before you head out, but the DEET doesn't stay on your clothes once you wash them. Be sure that you understand how either of these chemicals will interact with expensive fabrics such as Gore-Tex before applying. Be sure that your pets don't contract any of the same diseases that humans can get by leaving them at home or treating them regularly with medication that prevents ticks from biting and infecting your little buddies. We give our pups Nexgard once a month during tick season, which protects them from being bitten; the ticks start to bite, die, and fall off before they can become embedded. Take it from me, it's well worth the money to do this for your pups because you will ensure that they don't get bitten AND prevent them from bringing any ticks home that might find their way onto you or your loved ones. I know I'm biased but they're pretty cute. Something to consider in terms of safety is that if you are hunting Morels, depending on the Federal and State regulations determining when certain game seasons begin and end, there may be folks hunting Turkey, Quail, or other game depending on where you live and how the Morel season coincides with game hunting seasons in your area. To take precaution against being accidentally mistaken for game by a hunter, be sure to wear bright clothing such as a hat or shirt made of bright orange, yellow, or red material. Make sure you're on public land when hiking/mushroom hunting. If you are on private lands, make sure you have permission to do so. You don't want to end up like these folks. Be sure that you have a map, compass, and adequate navigation skills before deciding to hunt mushrooms off of established trails. Ryan advocates that these tools and skills are a must for those wishing to go off of the beaten path, because digital technology such as GPS and smart phones rely on batteries and may not work when in remote areas. Do not leave trails if you are not prepared to navigate and have a few snacks and water in the case that you become disoriented. When hiking off trail, be sure to tread as lightly as possible and avoid stepping on any single plants and walk around large patches of plants that tend to cover the forest floor such as trout lilies and trillium. When you find a morel, there are often others close by so when you find one, DON'T MOVE! Once I spot one, I usually crouch down and do a full visual sweep of the area around the one I found to make sure there are no others that I might miss or step on before moving on. Don't pull out the mushroom by its roots. Cut at the base near the ground. Make sure to collect the mushrooms in a mesh bag (not a plastic grocery bag). This allows the spores to return to the land, and grow more shrooms! I love hiking this time of year, watching the woods slowly wake up from winter. 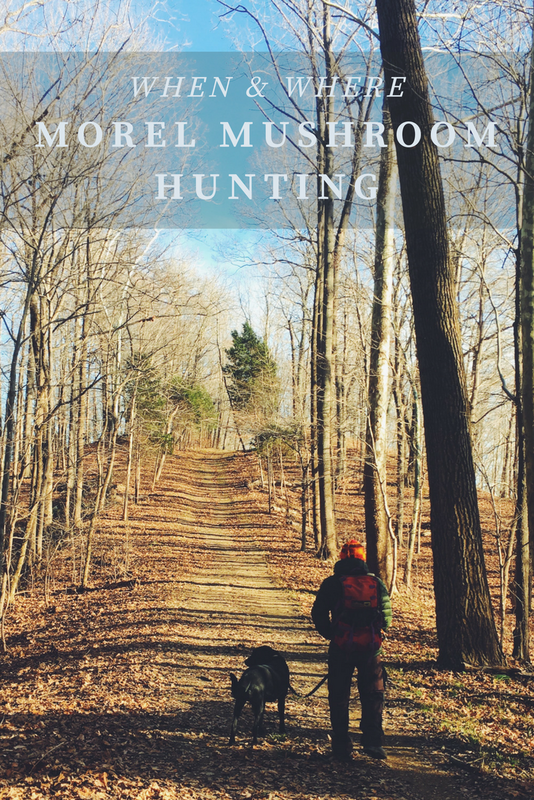 Even if you strike out on finding the morels, it is worth it to get out there and explore. Happy hunting! Have you ever found morels?